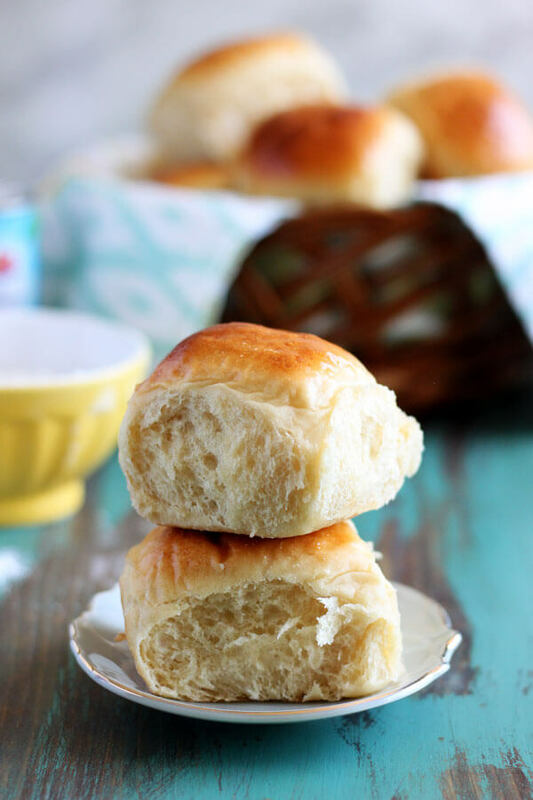 These homemade Hawaiian Dinner Rolls are soft and sweet, baked until golden brown. They are a wonderful addition to any meal. They will even make great sliders, hotdog and burger buns substitution, or an exceptional base for bread pudding! I love Hawaiian Dinner Rolls, and we would never have a shortage of them thanks to Costco 32 count pack. 😉 They’re good, they’re cheap, why would you want to make them yourself? Because baking is fun, of course. I would never say no to a chance to play with yeasted dough. And because when you make it yourself, you know exactly what you are feeding your family. 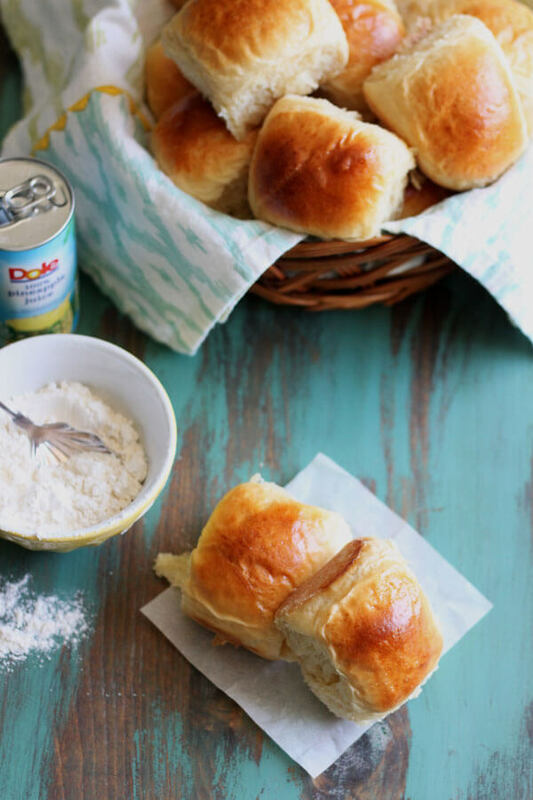 I used canned pineapple juice for these Hawaiian Dinner Rolls. But if you are game and want to juice a fresh pineapple, go for it! 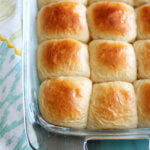 The pineapple juice gives these rolls a little tanginess, and it makes me feel all tropical and fuzzy inside. I’m obsessed with pineapple, and have been eating them all summer long after we came back from Maui. These rolls give me a chance to take my pineapple obsession to the next level. To make dough by hand (if you don’t have a stand-mixer), mix all ingredients in a large bowl with a wooden spoon, then knead the dough on the counter with your hands for the same amount of time or slightly longer. Rub your hands with a little bit of cooking oil when kneading dough. This will discourage the dough from sticking to your hands. This way you don’t have to add too much extra flour to the dough. Active dry yeast is very sensitive to temperature. It is optimal to bloom the yeast at around 100°F, but no hotter than 110°F. Too hot, and the yeast will die. On the other hand, colder than 100°F is okay. You can bloom the yeast with room temperature water, but it will take a bit longer. If the yeast mixture doesn’t puff up when bloom, it is best to redo this step until you get an activated yeast mixture. If you accidentally killed the yeast, your dough will not rise. Rising time can vary, depending on the environment: temperature, humidity, barometric pressure. The dough will rise faster in warmer weather compared to colder weather, in higher altitude compared to lower altitude, etc. But it will rise, it will just take time and patience. If you want to bake in the morning, you could let the dough rise overnight. If you want to bake before dinner, you should start the dough early in the morning. For the second rise, you want to be careful and don’t allow the dough to overproof. When over-proofing happens, the dough will rise to the max and then fall back on itself. This is not a big deal for the first rise, but not okay when you are preparing to bake. If this is your first time baking with yeasted dough, have patience. 🙂 Once you’ve mastered it, it will be easier than cake! 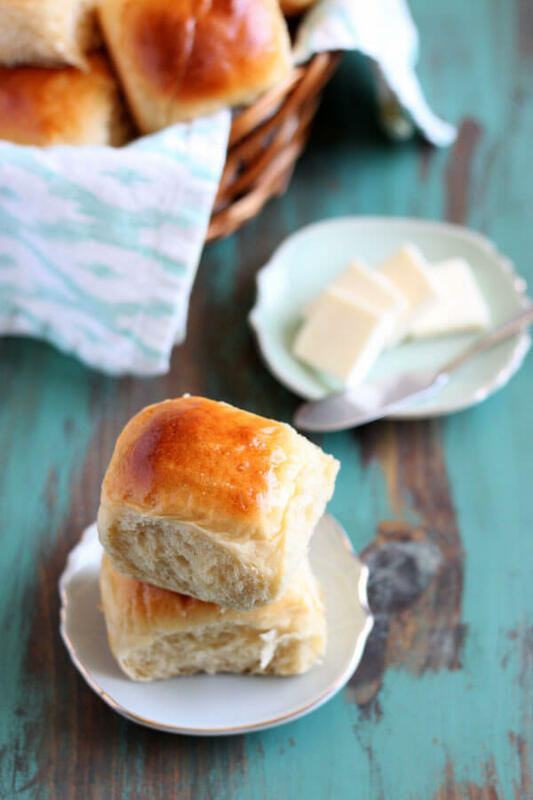 These homemade Hawaiian Dinner Rolls are soft and sweet, baked until golden brown. They are a wonderful addition to any meal. Mix warm water with the granulated sugar in a small bowl, sprinkle the yeast in the bowl and let it bloom for 10 - 15 minutes. Add flour, brown sugar and salt in a medium bowl and mix well with a whisk. In the bowl of your stand-mixer, add pineapple juice, melted butter and vanilla extract, mix with a whisk. Now add the flour mixture along with the activated yeast to the liquid mixture in the stand-mixer bowl. Knead with the dough hook on medium speed for 1-2 minutes just until the dough starts to come away from the side of the bowl. Turn dough out on a lightly floured counter, shape into a ball, put it back into the bowl and allow to rise at room temperature overnight or until double in size, this may take a few hours or longer. The next day, or when the dough has risen enough, turn it out on a lightly floured counter again. If the dough stick the the side of the bowl, just use a scraper to get it all out. Divide dough into 15 portions and shape them into round balls. Butter and flour a 9x13 baking dish. Place the dough balls in the baking dish and let them rise for about 2 hours. Prepare egg wash by beating one egg with 1 tablespoon of water. Brush the top of the risen dough with egg wash very lightly. Preheat oven to 400°F, and bake for 18 minutes until golden brown. 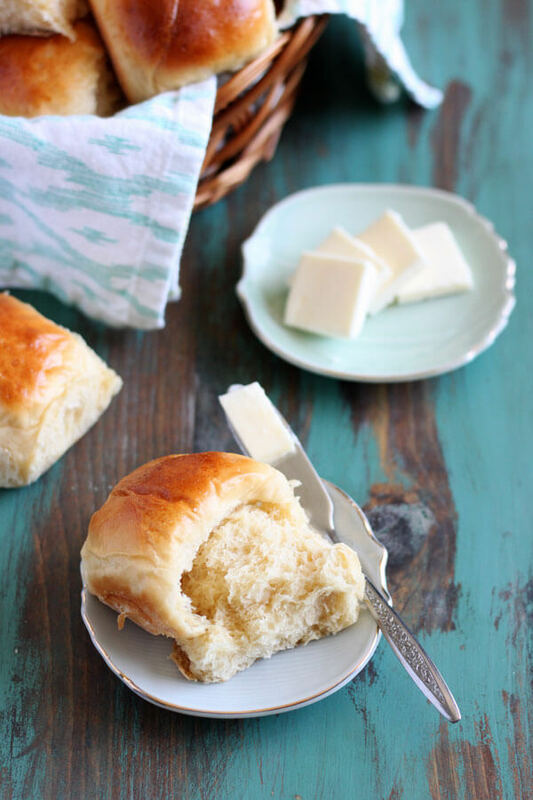 Serve rolls warm with butter. Prep time includes approximate rising time. 1. Follow the recipe through step #8. 2. 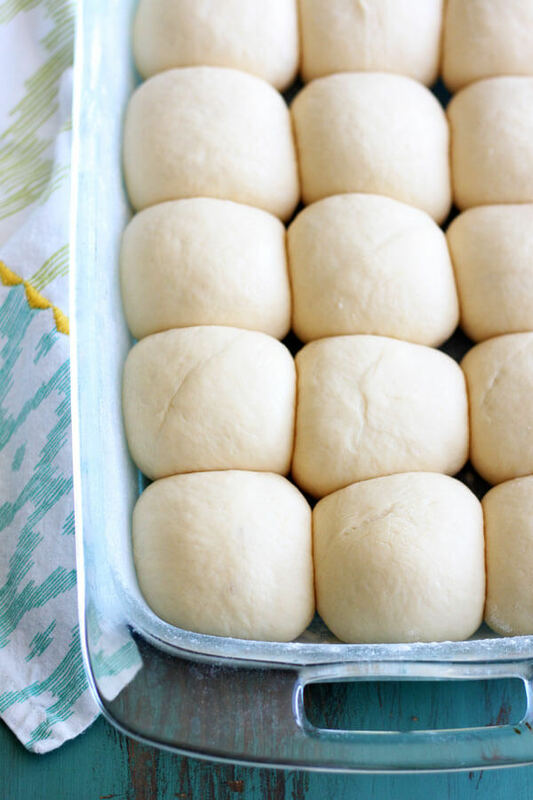 Once you divide and shape the dough into balls, freeze until they are solid. You can freeze them in the pan you’re going to bake them in and keep them like that or store frozen dough ball in ziplock bag. 3. The night before you want to bake, thaw the dough in the refrigerator. If you have them in ziplock bag, make sure to place them on baking pan or something flat so they don’t stick together once thawed. 4. The next day, allow them to rise at room temperature for their second rise and bake according to the remaining recipe instructions. These are DEFINITELY my favorite rolls! Love the sound of this homemade version! YAY! I’ve been looking for a roll recipe to make for Thanksgiving. I’m definitely going to make this one, thanks so much! 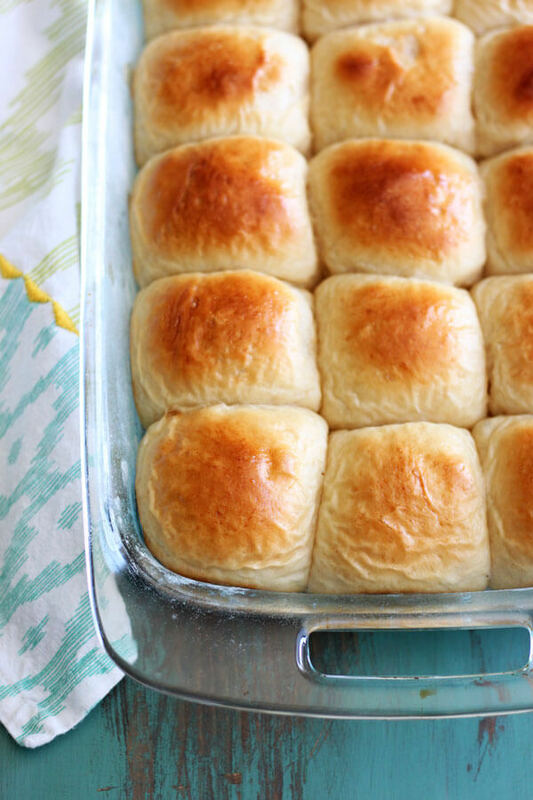 These rolls look so soft with a great texture! You just can’t beat freshly baked bread! Wow! 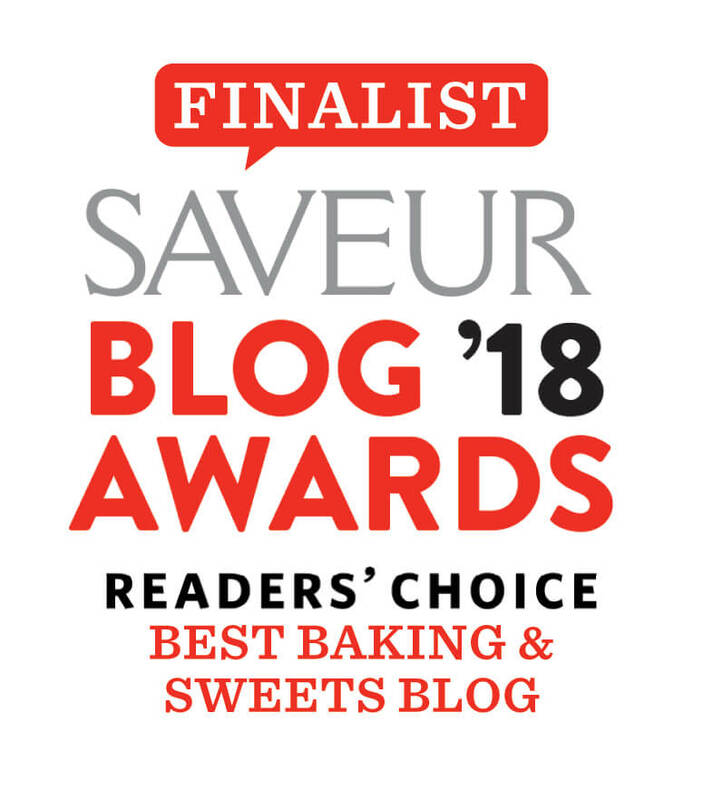 Looks gorgeous, I love bread baking more than cakes! I had bookmarked this from from one of the sites long back! Had completely forgotten about it ! This reminds me I should bake these soon! They look awesome they have turned out beautifully ! These rolls look perfectly fluffy and golden-brown on the outside! I love pineapple; I need to add this to my list of recipes to try! Hawaiian Rolls are pretty much the best! 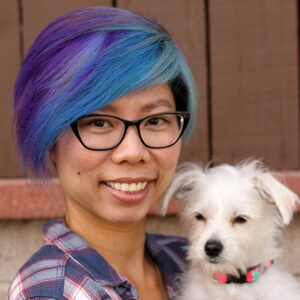 Thanks Jillian! So glad you stopped by. Oh my, they look wonderful, I don’t bake very often as it rarely scales well for two but I do love the sound of these so much. I have always loved these little guys and wondered what made them taste the way they do… PINEAPPLE JUICE. Thanks!